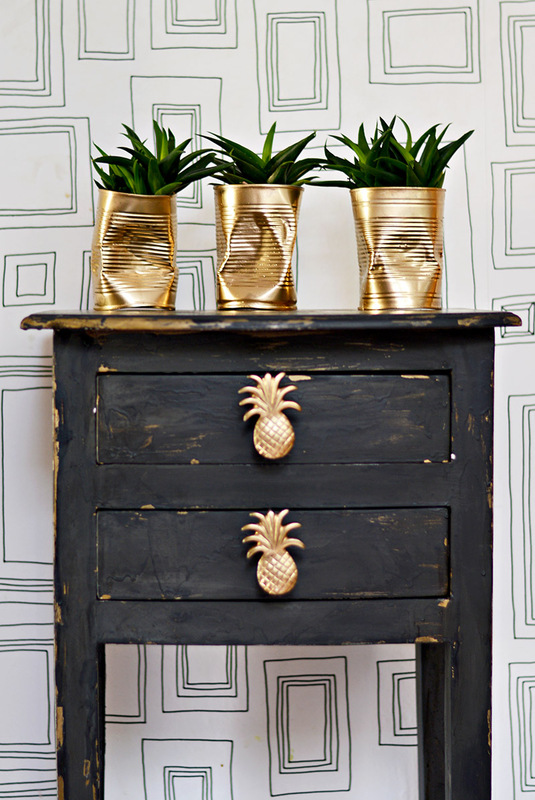 I’ve been trawling the shops looking for some lovely planters to match my fun pineapple stenciled table upcycle. (That’s a bit of an exaggeration, I looked in 2 shops!). Could I find any in my price range that I actually liked? NO! Therefore, the only way to go was to make my own DIY planters. I don’t know why I didn’t think of this in the first place, as it only took me 10 minutes. And the bonus, they cost me almost nothing as I had all the stuff already. I love my shabby glam table and wanted to accessorise it with a cute succulent in a shabby glam planter. As these days no home seems to be complete without some succulents on display. 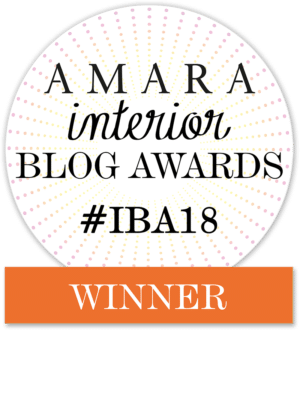 Well in blog land anyway! By the way, I’m not sure shabby glam is a thing or something I made up. It’s, however, I knick name I’ve given to the upcycled chippy crafts that I try to add glam to by spraying them with chrome gold paint. 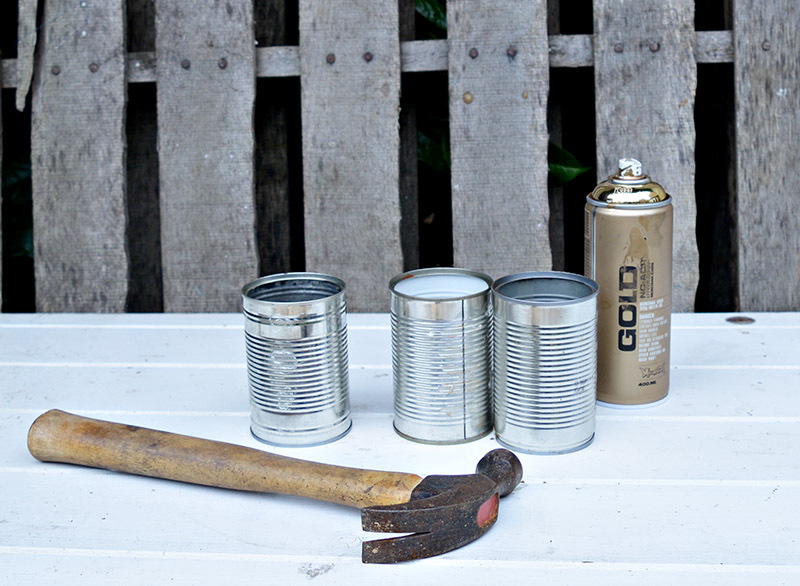 These DIY planters are shabby in that the tin cans are crushed and the glam bit is the chrome gold spray paint. This is such a ridiculously easy, quick and cheap craft. 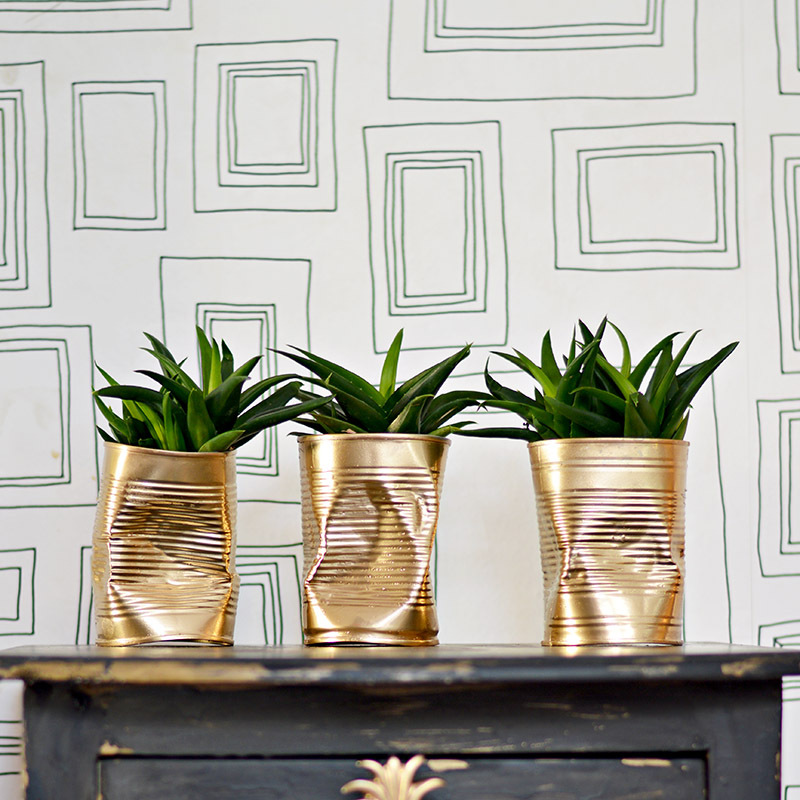 Chrome gold spray paint – I had some left over from my pineapple stenciled table upcycle. 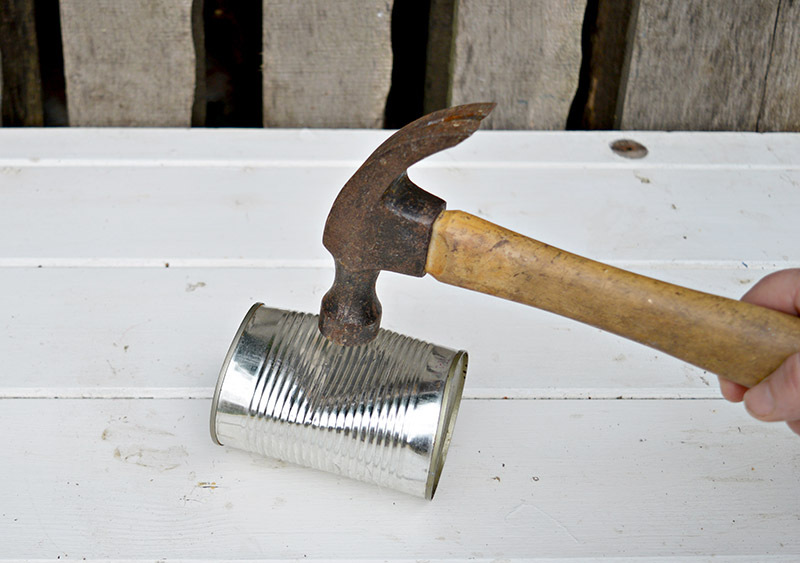 To achieve a sort of crumpled bag look with your tin cans you will need a hammer. I bashed the tin cans in the middle to crush them. Rotating them as I bashed away. This was fun but don’t get too carried away taking your frustrations out on a tin can, you want them to be useable and not a crumpled mess. 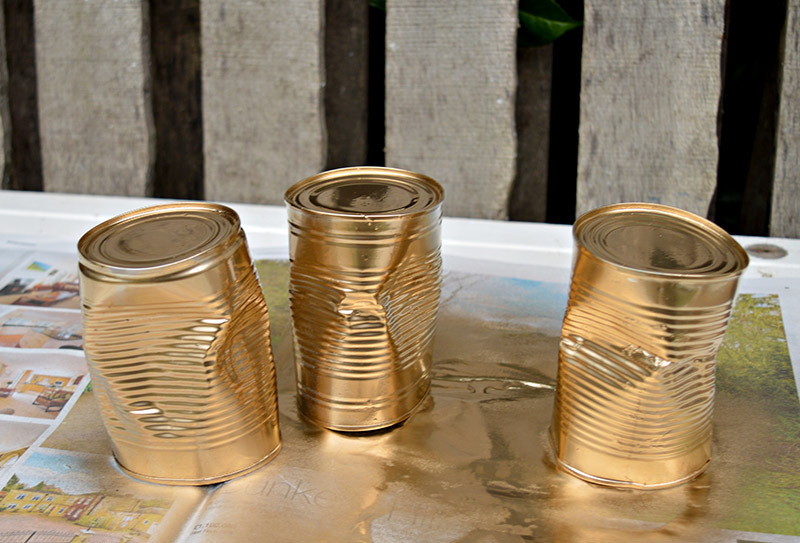 Once you are happy with the way your tin cans look, simply spray with the gold paint. 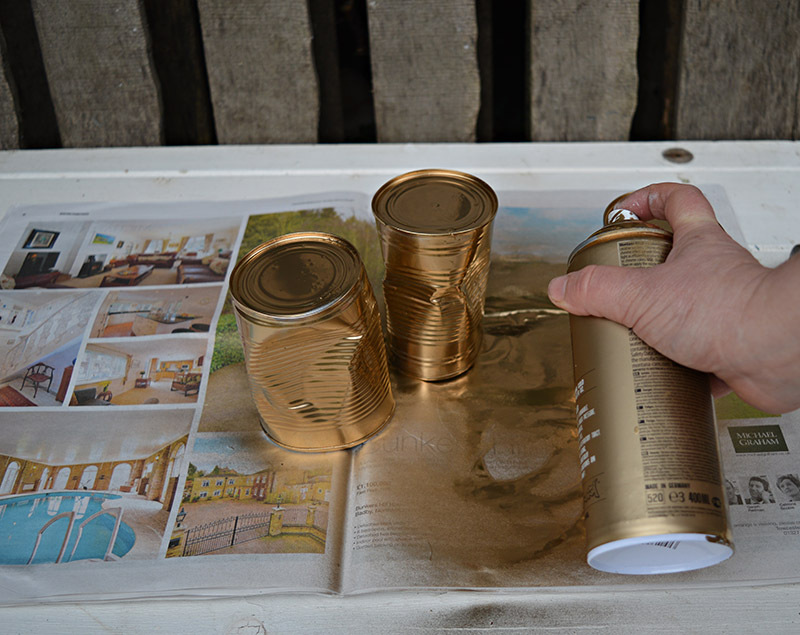 If you are looking for a particular kind of gold look then you might want to check out this review of gold paints. 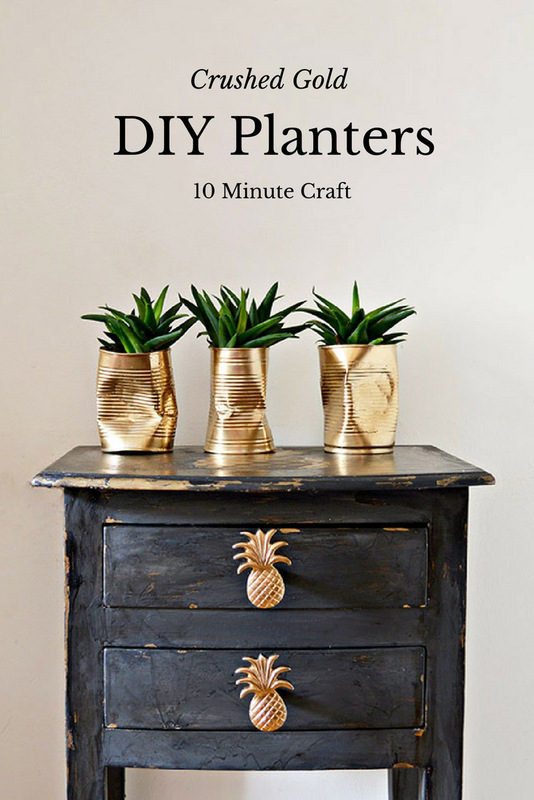 Once dry your DIY planters are ready for your succulents. To help with drainage like with my colourful tin can planters, I put a layer of gravel in the cans before adding compost and plants. I love my shabby glam DIY planters. 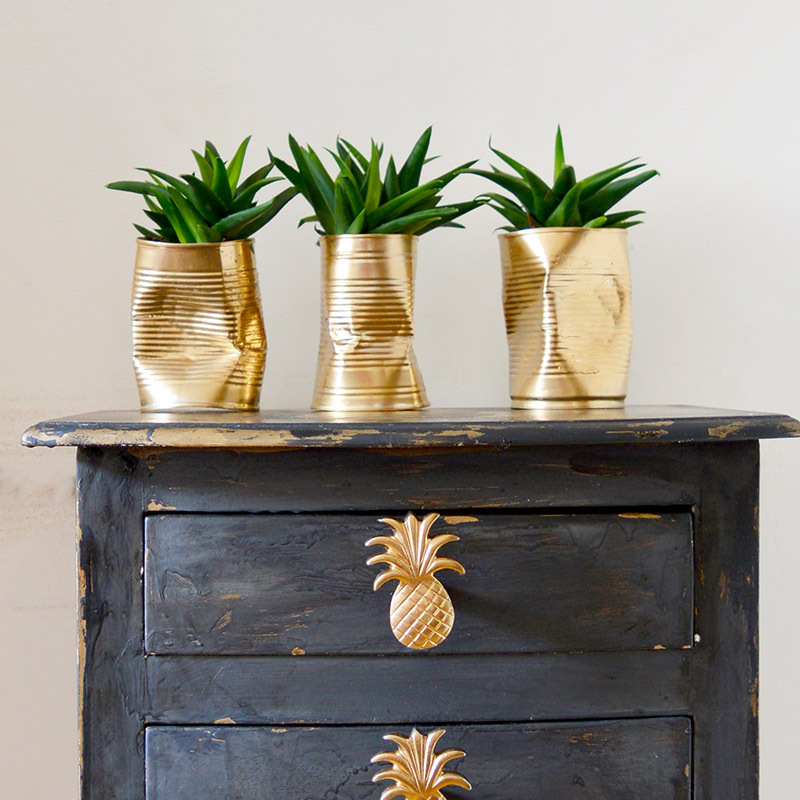 Especially with the combination of the gold and the spiky succulents as they kind of look like pineapples. Which makes them perfect for my pineapple stenciled console table. I think they look great on my stencilled console table. I’m really pleased how they turned out, plus I can spend the money on something else now. If you liked this you may want to check out my colourful tin can planters and my upcycled window herb planter. Thank you Marie! and thanks for the pin. Here from Nifty Thrifty Things and now following 🙂 I love this idea they are SO cool!! Thank you so much and thanks for the follow. These are perfect on top of your table and they do resemble pineapples. Instead of having a cookie the next time I’m frustrated I’ll give some tin cans a whack or two! Thank you for sharing with us this week at Celebrate Your Story, have a great weekend. Thanks, I like the idea of reaching for the hammer rather than chocolate in times of stress. These are brilliant, and for next to nothing too – bonus! I love your definition of trawling the shops – hyperbole is the best thing ever! Thank you Julie. I love a free craft. I never would have thought to crush the can. Love the gold! Thanks for sharing with us at Merry Monday. We love your creativity. Claire these are so quirky fun! And you’re right they look perfect on top of your pineapple table. Who doesn’t love easy peasy? I’m looking forward to your next projects! Thank you, thanks for the feature that’s awesome! Another fantastic project Claire, and love that table too, wow! thanks for sharing on craft schooling sunday! This is so smart, cute, an inexpensive! I love how it looks like a crumpled bag. Great idea! I will have to do this and share you post. Thanks for the great idea! Thank you! The crumpled bag look was what I was going for. I love your wallpaper btw! Shabby glam? Why not, Shabby Chic sort of the same idea. Truthfully the smashed part is not something I could live with, but I love the idea of it for someone else and what a great conversation piece, right? They look lovely on your table. Thank you Debbie. I kind of think of Shabby chic as more French white chippy furniture but both kind of very similar. But the end of the day it doesn’t really matter what you call it. I actually have some drinking glasses which are molded into that crumpled bag look which gave me the idea. Thank you Jeanne, and thanks for hosting. These are so fun, Claire–thanks for sharing @Vintage Charm! Thanks and thanks for hosting. I love these! I have been on a kick of taking products and repurposing them. These are perfect! Inexpensive, easy and glam! Thank you! Yes very cheap and quick and easy. That is so incredibly creative! And it goes perfect on the dresser! Thanks for sharing at the Pleasures of the NW’s DIY party! Thank you so much and thanks for hosting. Cheers and thank you so much! Thank you so much and thank you for visiting my page. I love these! And the gold color is perfect (and gold isn’t even my color!) I may have to figure out a way to add these to my guest room. Thanks for sharing on the Waste Less Wednesday Blog Hop! Thank you! Gold isn’t really my colour either but it has grown on me lately and I love just a hint. You can always try copper. Good idea! Looking forward to a spray paint project as soon as the weather gets warmer. Thank you, yes I’m looking forward to crafting outside too. Fun, fast, inexpensive and Gold. These would make a really cute gift, to a teacher or girlfriend. What a fun way to share succulent plants that grow in bunches as they mature. Thank you, very fun, very fast and very cheap. So cute! Gold spray paint is the best! I love those drawer pulls, too. Thank you, the draw pulls were a Christmas present. I have a thing about pineapples! Thank you, it’s got to be one of the quickest crafts ever. Thank you! I think they would look great on a porch. These are great! I think I like these crushed cans better than the crushed bag planters that are trendy these days. Visiting from Tada Thursday party. Thank you, Victoria, and so ridiculously simple to do. 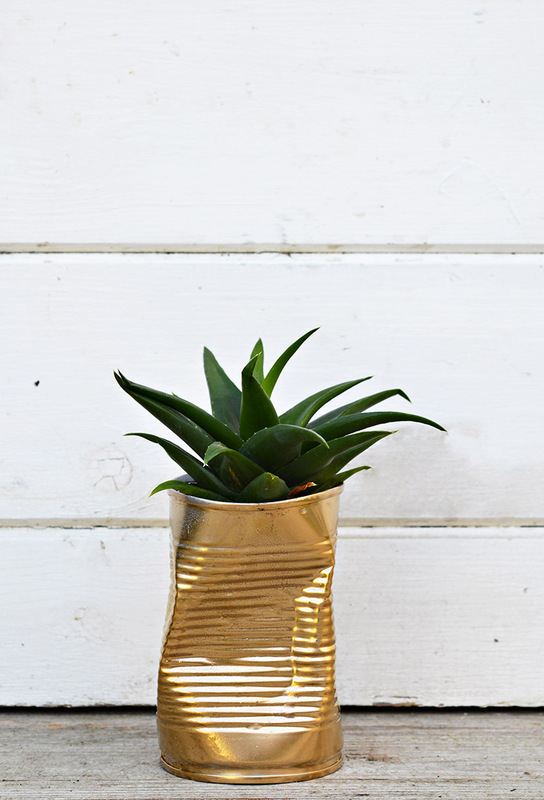 What a fun way to add some glam to any room with your crushed gold cans. 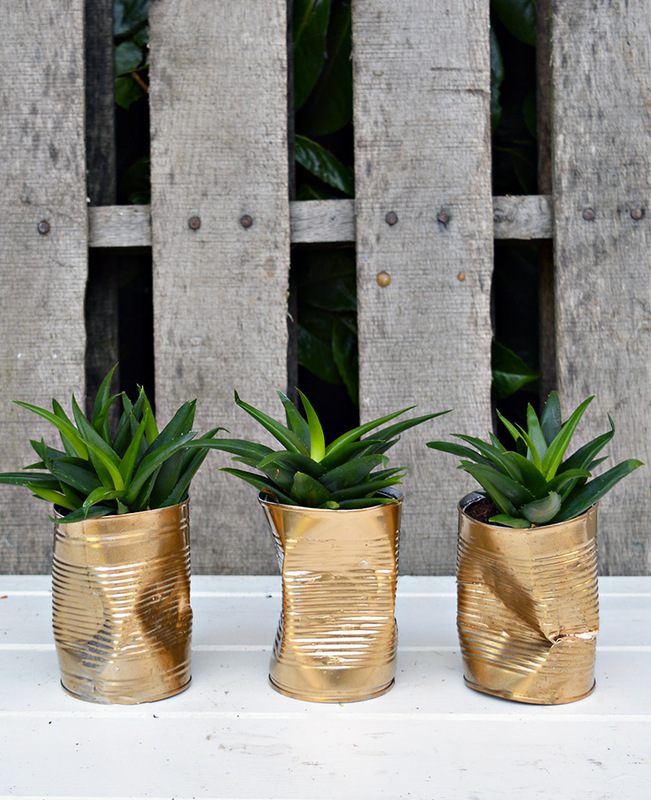 So simple, and you could paint them any color you wish, and they make super cute planters. Thanks for sgaring!